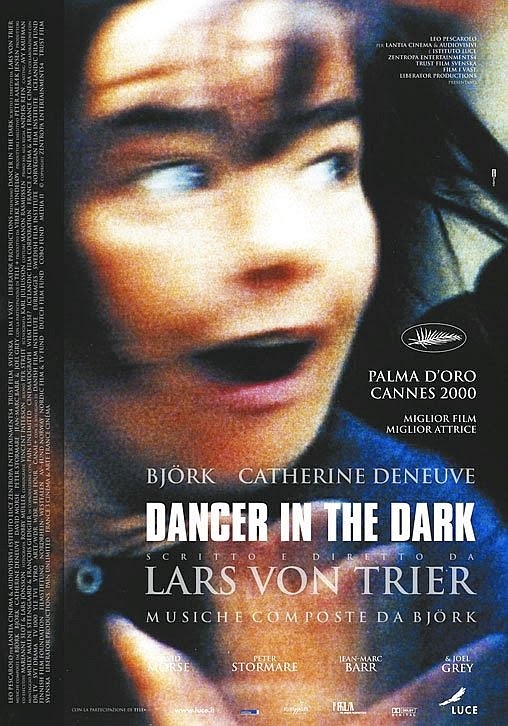 I just finished watching (again) the Palme d'Or winner at the 2000 Cannes, Dancer in the Dark by Danish Dogme director Lars Von Trier. This was the third film in von Trier's "Golden Heart Trilogy"; the other two films being Breaking the Waves (1996) and The Idiots (1998). Dancer in the Dark is a powerful fable of a blind woman sacrificing her life for her son, and the experience of this movie may be traumatic. Astonishingly heartbreaking and extremely thought-provoking (depending on how you interpret this movie), the theme of Dancer in the Dark is using the ability to fantasize to overcome the suffering in reality. This Danish musical drama is almost like a weird documentary with crime-tinged undertones, a hauntingly good soundtrack and beautifully shot with handheld video cameras. As the main character, Icelandic popstress Bjork is Selma, a naive, goodhearted mother who is going blind from a congenital disorder and working in a factory to save money to rescue her son from the same fate. After multiple misfortunes, to say the least, Selma suffers a devastating consequence brought upon by her own trust and naivete. In her darkest moments, Selma copes by imagining her dismal surroundings to be the setting for a grand musical. To her ears, the machinery in the factory where she works becomes a symphony, and workmen dance with brooms with the grace of Fred Astaire. Men lift up women in leg splits as bells chime, and day-to-day activities are choreographed as if the world is perfect, and we exist to sing jubilantly in praise of it. Instead of her grim murder trial, Selma imagines the courtroom as her grand finale, with friends there to catch her should she fall. Bjork is a stand out in this movie and fully justifies the many accolades and awards she received for this film. An esoteric movie this is, the second time viewing was an insightful and refreshing experience! And those interested in the fantastic soundtrack, must checkout Bjork's Selmasongs shared below!